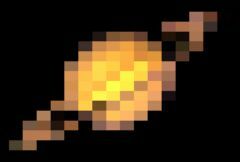 Generates a pixelated version of the source clip. Adjust the size and shape of the blocks using the Pixel Frequency and Pixel Rel Width parameters. Increase the Smooth Colors parameter to cause the colors of nearby pixel blocks to be more consistent, and less flickery over time. Pixel Frequency: Default: 20, Range: 1 or greater.